Perhaps you, a family member, or a friend is writing a book. Don't forget to channel your inner CEO along with your creative muse. Hank Quense, a popular author himself, writes an engaging primer called Business Basics For Authors. This is part of a series to help self-published writers. He recommends that you use SWOT which analyzes Strengths, Weaknesses, Opportunities, and Threats. You will also need to crunch the numbers as income from self-publishing may be taxable. He explains the rationale for obtaining a tax identification number from the Internal Revenue Service; there are fewer limitations on expense deductions and your writing business is professional in the eyes of the government. Of course, income and expenses from any business need to be tracked. And don't forget to make a marketing plan as you build your writing business. Once you have the words on the page, or the images on the screen, you want to place your creation in the hands of your reader. Hank Quense makes the business of being a writer easy to digest with a bit of humor. There are simple but elegant graphs and flowcharts to highlight technical concepts. There are also plenty of practical links and templates which prompt the reader to take action. Pertinent applications software is listed since access to the right information can be half the battle. 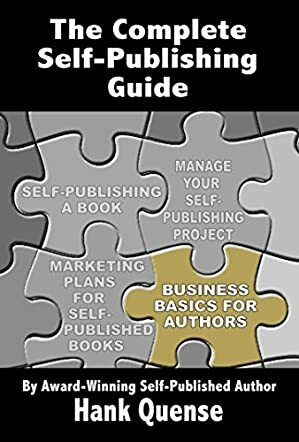 Business Basics For Authors by Hank Quense is a great way to build your career as a self-published writer and to feel confident as a newly-minted business owner.